It is said that a picture is worth a thousand words — but it still needs to be the right picture to pick the right words. My guest today is Cathy Holtmann, Director of the Muriel McQueen Fergusson Centre for Family Violence Research and Associate Professor, Sociology Department, UNB. She joins me to talk about this multi-location research project using the “PhotoVoice” methodology to explore issues of interfaith dialogue. In this project, students and others explore concepts and discussions using photographs as the focus. 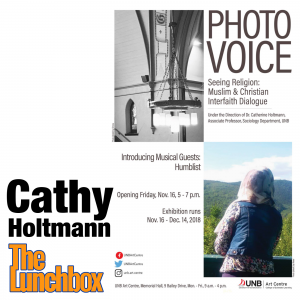 PhotoVoice is on display as an art project at the UNB Art Centre starting on November 16 with an opening night from 5pm to 7pm.